Exactly eight years ago, in this same context and from this same rostrum, the President of my country, Néstor Carlos Kirchner, addressed the Assembly, four years after having assumed the presidency of the Argentine Republic with only 22 per cent of the vote. 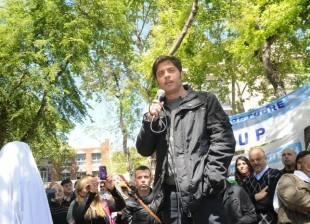 Given the situation of the Argentine Republic — which had fallen into default in 2001, where about a quarter of the population was unemployed and levels of destitution and poverty had exceeded 50 per cent — he stated that the multilateral credit institutions needed reform, particularly the International Monetary Fund, as did the political bodies of this honourable Organization. 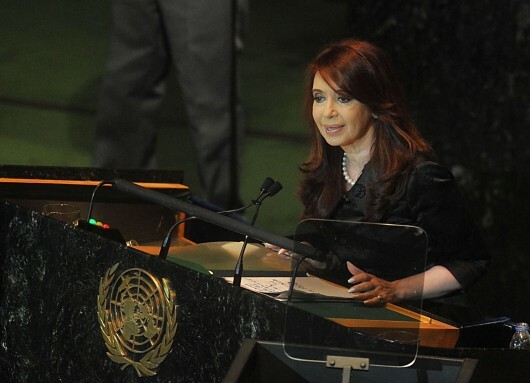 President Kirchner made five speeches to the General Assembly, and I have made four. This is my fourth statement as President of the Republic. In each of our addresses we have made the same calls to a world that has changed significantly since 2003, when the Argentine Republic was cast as a black sheep gone astray and which found itself in default because of a continued failure to fulfil its obligations. In reality, we were victims, used as guinea pigs in the experiments of the 1990s and neoliberal policies. Much has happened since then, when Argentina defaulted on the largest debt — at least, so far — in the history of humanity, $160 billion. Over the past eight years, Argentina has restructured its debt, reducing it from 160 per cent to less than 30 per cent of gross domestic product (GDP). The rates of poverty and indigence have been reduced to single digits, and we must continue that fight. Our unemployment rate is among the lowest, and we have completed the most significant cycle of economic growth in our 200 years of history. Among the emerging countries of our region, Latin America, Argentina has had the leading growth rate and is regularly paying its debt without turning to capital markets. I am not going to list all of the numbers, but they are very compelling. In 2003, we spent 2 per cent of GDP on education and 5 per cent on debt payments. 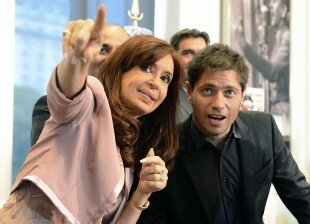 Today, Argentina devotes 6.47 per cent of its GDP to education and spends 2 per cent to debt payment. The situation in the world is quite different. Many regions and countries have severe problems. Argentina does not pretend to be a model or an example for anyone, but we do wish to reaffirm the need to formulate clear rules with regard to the transfer of capital in the area of financial speculation. Many speakers before me, and doubtless many more to come will do the same, have complained about financial commodity speculation, especially in the food sector. When we compare the growth of global financial stocks to global GDP — what all of the citizens and businesses of the world produce in goods and services — it becomes clear why we are facing a world where speculation is out of control, careening from one side to the other and from one country or region to another, affecting currencies, economies and the daily lives of citizens, destroying jobs and preventing people from obtaining a dignified education and health care. for these shares, they are mere keystrokes transferring numbers from one place to another, from one currency to another, producing unparalleled market volatility and recurrent crises whereby exchanges go up and down on a daily basis. This not only destroys thousands of jobs but also generates immense profits that someone is pocketing. We would like to reiterate once again, in the light of our own experience — and I reiterate once again that I do not want to set up a model — the need for multilateral credit organizations to work extremely hard on regulating the global movement of capital and financial speculation. If this does not happen, it will be impossible to achieve that ever elusive market stability, and as a result, the economies of both emerging countries, which have been sustaining the growth of the global economic activity, and developed countries alike will be overwhelmed. It is crucial that this message be understood, because today we may see speculation on food; yesterday, it was on oil, and tomorrow, it could be on little candies, if that would be profitable and beneficial to the moving of this capital, which gets transferred from one side of the world to the other without any control or regulation whatsoever. Here I must say that, as a member of the Group of 20 at the London meeting — when it was decided to inject an enormous amount of financial resources into the financial sector that was experiencing problems — I maintained that it was necessary to guarantee that those resources being injected into the financial world could later return to the real economy, the concrete economy, to be able to generate employment, products and services. Unfortunately, we continue to find ourselves in the same situation, because other than the changes that I would describe as purely cosmetic, we have gone no further with the necessary regulation. Moreover, the credit ratings agencies — which bear a great deal of the responsibility for much of what has happened — rate Argentina, for example, as a marginal economy. Until very recently, they categorized economies on the brink of default higher than that of Argentina. Therefore, transparent regulation of the ratings agencies is needed, as they bear a great responsibility for the crisis we are currently seeing in various regions — which will, of course, have an impact on all countries. It is regrettable that we have been asking for the reform, reorganization and modification of the multilateral credit bodies for so long now. Indeed, we believe that this task should already have been begun, already formulated, in order to avoid precisely what we are experiencing now. For some people it is just a matter of numbers on the stock market, but for others they signal the destruction of the hopes of a lifetime. As I was saying to a colleague the other day during a visit to Europe, economic crises always end up impacting the political system. There cannot be a serious economic crisis, in which millions of people fall into poverty and lose their jobs, homes, education and health, without that also signalling profound political transformation. And when such political transformation results in further serious economic crises, the result is experiences that I will not go into now. Totalitarianism often came out of crises. The twentieth century produced crises that were not adequately solved by political means. I call once again for the reform of this important Organization, which represents multilateralism — something we have always consistently defended. We need a more pluralistic and diverse world, and to make political bodies such as the United Nations, and crucially the Security Council, more democratic. We do not agree on the need to expand the number of permanent members; on the contrary, we believe that the permanent member category should be eliminated. The right to veto also should be eliminated, as it really prevents the Security Council from carrying out the true functions that it had in the bipolar world in which it was originally conceived. At that time, the right to veto was necessary, because in that bipolar world, with the fear of a nuclear holocaust, that right gave to Council members the balance necessary to ensure the security of humankind. Today, that balance is broken. Permanent seats and the right to veto are not about defending security or universal stability; rather, they are often about the position of Council members exercising their right. I would like to make another point, one linked to the situation that we have been describing, with regard to what is shown by the injustice of certain countries — five, to be exact — on the Security Council having veto rights. Once again, we have come to the heart of the United Nations to raise an issue that is just as vital, and not only to Argentines. The question of sovereignty over the Malvinas Islands is also a trial by fire for this body in terms of whether it is possible for it to comply with a policy that is essentially multilateral and under which all members are obliged to accept the resolutions of this Assembly. Ten General Assembly resolutions have invited the United Kingdom and my country to sit down to negotiate and discuss our sovereignty. 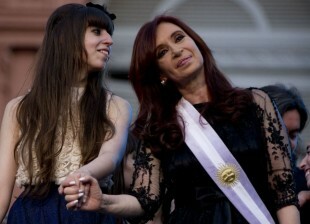 Bear in mind that Argentina is not asking for those resolutions to be implemented in terms of recognizing sovereignty. No, it is simply asking for compliance with some of the provisions of the 10 United Nations resolutions on the matter. Perhaps we could also list the 29 resolutions of the Special Political and Decolonization Committee and the 11 resolutions and 8 declarations of the Organization of American States, as well as the resolutions of various forums — Ibero-American forums, the Union of South American Nations, the Common Market of the South, meetings of the Arab and African countries — and the entire world. Through such resolutions and declarations, all of them have been demanding that this issue be addressed. The United Kingdom has systematically refused to do so and has obviously used its status as a veto-wielding member of the Security Council to that end. The year 2013 will mark the passage of 180 years since the Argentines were expelled by force of arms from our Malvinas Islands. Next year will mark 30years since an incident — which the United Kingdom took advantage of — that was committed by the most terrible dictatorship in memory, of which we Argentines were ourselves victims. I am proud to be the Government that has set an example for the world in terms of human rights and the prosecution of those responsible for committing crimes and acts of genocide. That is why I believe that focusing on that incident is nothing other than one of the many excuses given to justify non-compliance with United Nations resolutions. What is worse, I ask all of those who see themselves in the mirror of a future world in which natural resources will be necessary, to see how our natural resources, our fisheries and our petroleum resources, are being stolen and illegally seized by those who have no right to do so. Obviously, I do not feel it necessary to emphasize the fact that no one can lay claim to an overseas territory that is more than 14,000 kilometres away. That is clearly an illegal occupation. Once again, we call upon the United Kingdom to comply with the resolutions of the United Nations. Recently, there have been genuine provocations, including missile tests in May and July, which were denounced before the International Maritime Organization, which also suffered one of those attacks. Once again, I reiterate to this Assembly and to the United Kingdom Argentina’s interest in dialogue. It is true that much time has passed, however. We state here, before this Assembly, that we will wait for a reasonable period of time, but if nothing transpires, we will be forced to begin reviewing the provisional understandings that are still in effect. We emphasize in particular that the question of sovereignty must be included in those understandings. Members may ask what I am referring to here. It is the joint statement and exchange of letters of 14 July 1999 on resuming a regular weekly LAN Chile flight between Punta Arenas and the Malvinas Islands with two monthly stopovers, one in each direction, in Río Gallegos. Argentina has no intention of exacerbating the situation for any party, but it is also fair that this Assembly and the United Kingdom be aware that there must be compliance with the resolutions. We cannot wait 180 years, or 30 years, just as Palestine cannot be making pilgrimages over the decades to find a place in the world. Still less can the Argentines wait to reclaim the territory that legitimately belongs to us. I cannot conclude without referring to an issue that has been mentioned in all of the statements that President Kirchner and I have delivered here since 2003. A few moments ago, when I spoke of the question of Palestine, my authority to do so — if indeed it gives us authority, as such — is derived from the fact that we are one of the only two countries in the Americas that have been the target of international terrorism. This happened on two occasions. In 1992, there was the explosion at the Israeli Embassy in Buenos Aires, and in 1994, there was the blast at the Argentine Israelite Mutual Association (AMIA), which is one of the most important mutual associations in Argentina. I stress not that it is a Jewish association, but that it is an Argentine association. This was an attack on Argentina. I am demanding, on the basis of the requirements of Argentine justice, that the Islamic Republic of Iran submit to the legal authority and in particular allow for those who have been accused of some level of participation in the AMIA attack to be brought to justice. Last year, we proposed here that if they did not trust our country’s justice system, we could take the approach that was taken for the Lockerbie case: we could choose a court from a third country, by mutual agreement, in order for that court to be able to provide the only thing that we are demanding — that is, justice. We insist on this because it is a universal demand. It does not have to do with political positions. This word, justice, is in the Talmud, the Bible and the Koran, and, for those who do not believe in anything, I am sure it is in their country’s constitution. 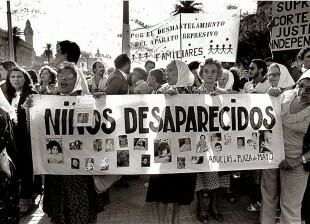 The Government of Argentina received, on 16 July, a message from the Foreign Ministry of Iran stating that it intended to cooperate in initiating a constructive dialogue with Argentina in order to help us get at the truth with respect to the brutal attack against the Argentine Israelite Mutual Association of 18 July 1994. The message that we received from Iran, although signifying a change of attitude on the part of the Government, does not satisfy our demands, which, as I said quite clearly, are for justice. 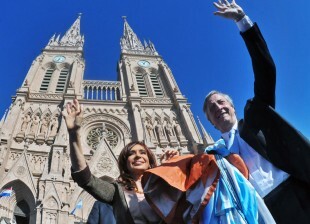 However, it is an offer of dialogue that Argentina cannot and must not reject. We are here calling for dialogue with the United Kingdom and dialogue among all the parties that make up this body. My country does this on the basis of its commitment to fulfilling its obligation to resolve controversies through peaceful means. This attitude has characterized our country throughout our history. This means that in one sense, Argentina must put aside the requirements arising from our national justice system with respect to prosecuting the presumed perpetrators of these attacks. In another sense, we cannot do this, as this is up to judges and public prosecutors. What we would like to say, however, is that we think that this dialogue must be constructive. It must be a sincere dialogue and must achieve results in order to be credible and therefore not be understood as just a delay tactic or a distraction. I will conclude my statement. 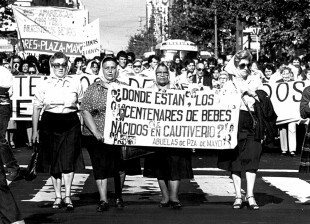 Sometimes, I think of everything that has happened to Argentines. These things have happened to many countries at various times, but they have all happened to us, in our country, during our history. We have had the worst economic and social disaster in living memory. We still have today a Power exercising a colonial influence in our country. International terrorism has twice made us the target of its attacks. So, if we think of it, it is as if all of the problems and all of the tragedies and miseries of this world decided to focus on one single country. Our capacity to recover, in terms of the economy, our tireless and never-ending fight to recover what is ours, our never-ending demand for justice for the victims of the attacks, and the strength that we have drawn from all of these tragedies give me the confidence and certainty that this is the path we have chosen: that of achieving growth along with social inclusion for our fellow citizens. It is the path of ensuring that there is unlimited respect for human rights, with trials carried out for the sake of remembrance, truth and justice. It is the path that ensures that today, as the President of all Argentines, I can be accompanied here by family members of victims of the AMIA attack. They have confidence that the Government will continue to do what it has always done, which is to defend the values of truth and justice. That is what gives me great hope that God will shed light on the path of all those who have to make decisions, not with a view to elections but with a view to the destiny of the world in upcoming decades. That is why I would like to greet everyone today who has taken the floor or who will take the floor and thank the entire Assembly for the support that they have each given, in all of these causes, to my country, the Argentine Republic.